You can enjoy conversations with people from a variety of countries!! 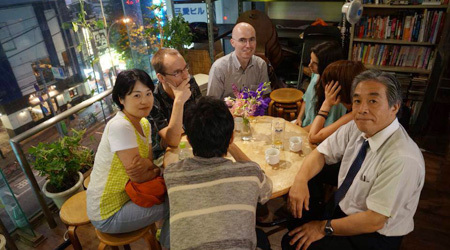 English conversation bar & cafe Mickey House has been in Takadanobaba, Tokyo for over 30 years. There are many customers from a variety of countries. Come meet our interesting and fun customers & staffs! We have 16 kinds of language tables, you can enjoy conversation with Japanese craft berer, whisky, and Sake! Here you can concentrate for conversation without caring about age, job, nationality. In a living room atmosphere, you will be able to have a relaxing talk about a variety of subjects, ranging from languages to social issues. You can enjoy talking in multi-languages and deepen your cultural understanding. Now we have a table for English, French, German, Spanish, Italian, Portuguese, Swedish, Russian, Polish, Chinese, Korean, Thai, Vietnamese, Hindi, Indonesian, Japanese. No time limit, All-you-can-drink hot coffee and tea! Our system is quite simple. Just pay the entrance fee or order 1 drink and you can stay until closing time. We have variety of alcohols, professional espresso drinks! *To join in a beginner's table, you may pay the same price as Japanese customers. (1900yen for adults, 1500yen for students.) *Japanese table is just +500yen. We also have a Japanese conversation table! 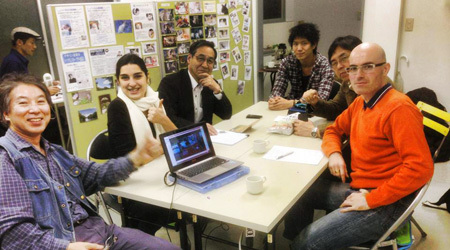 If you don't have enough chance to use Japanese, come on every Saturday from 6pm to 9pm! We need conversation staff sometimes!! Native staff wanted. Please ask us if we need staff or not. Room share is the cheapest way to stay in Tokyo! Let's find a share house or guest house! Here is the information for our 2 houses!